Facet syndrome (also known as facet joint syndrome, facet joint disease or posterior joint dysfunction) is a form of back pain centred on the facet joints in the back. This can happen because of an injury, or in diseases like arthritis. The facet or zygapophyseal joints are the connections between the vertebrae (bone in the spine). There are two between each vertebra, and these link the vertebrae, and help support the weight of the body and keep the spine flexible, but also stop the spine from bending too far. These are known as synovial joints – the joint is lined with cartilage, and there is a capsule enclosing the joint, filled with synovial fluid. Facet syndrome in osteoarthritis can be caused by the development of bony spurs on the facet joint that press on the nerves. Other causes include disc damage caused by injury, degenerative disc disease or extra wear (this can happen in people who overextend their backs a lot, such as gymnasts), making the bones more likely to rub together. Whiplash injury, for example after a car accident, can also lead to facet syndrome. Being overweight or obese can make facet syndrome worse. Facet syndrome causes pain and stiffness in the back, including difficulties in looking or turning to the left or right, or muscle spasms causing sudden pain. Pain may be worse on twisting, straightening up or bending backwards. Facet syndrome in the lower back can cause a deep, dull ache that moves down into the buttock or thigh as well. Facet syndrome in the neck or the cervical vertebrae (the bones at the top of the spine) can cause neck and shoulder pain and headaches. How Is Facet Syndrome Diagnosed? Facet syndrome is diagnosed through medical history, and imaging including X-rays, CT (computed tomography) scans and MRI (magnetic resonance imaging) scans, which will show the damage and/or inflammation around the facet joints. Diagnosis may be confirmed by an aesthetic injection into the facet joint – if this stops the pain, then it is facet syndrome. The simplest treatment is taking non-steroidal anti-inflammatory drugs (NSAIDS) such as ibuprofen to reduce the pain and swelling. These may be over-the-counter or prescription strength. If these are not effective, the doctor may prescribe stronger painkillers or muscle relaxants. Doctors can reduce the inflammation and pain in facet syndrome by injecting anti-inflammatories and local anaesthetics into the joints. If this pain relief does not last long, radiofrequency (RF) rhizotomy or neurotomy may help. This uses radio waves to shock and inactivate the nerves that carry the pain signals. Radiofrequency rhizotomy takes two to three weeks to take effect, and should last for nine months to three years, until the nerve regrows. In some patients, the pain may be worse for the first few weeks. Exercises to improve back strength and flexibility can help with pain and stiffness, and can improve flexibility. Strengthening the core muscles will also take the strain off the spine. 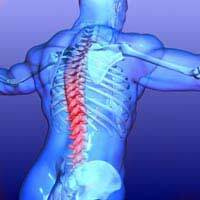 Spinal fusion may help in severe cases, but this is a last resort. Researchers are carrying out studies to see if it would be possible to replace facet joints.